A chance discovery sends Arizona Rose on a new life of adventure! Arizona Rose: humble antique collector, or treasure-hunter extraordinaire? While shopping for exotic antiques, Arizona stumbles across some old maps, which turn out to hold the key to Blackbeard's lost treasures! But the treasures' locations are concealed by a clever code, and Arizona needs your help to crack it. Join Arizona on her epic treasure-hunting quest, with 200 levels of picross to solve and numerous treasures to discover. Along the way, you'll also collect powerful items to help you and encounter hidden object scenes and other exciting mini-games. You can also show off your puzzle-solving prowess by collecting all 15 achievements! 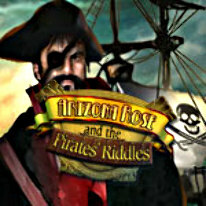 Whether you're a picross fanatic or a first-time solver, Arizona Rose and the Pirates' Riddles will keep you coming back for more. There's always one more puzzle to solve, one more cave or shipwreck to explore, and one more treasure to take home at the end!